Very interesting. I do think that the term "morph" has not been universally defined. It does seem as if you feel most comfortable defining morph in terms of traits that are clearly dominant, recessive or co-dominant and less comfortable labelling polygenetic traits as morphs (just my interpretation). I don't particularly agree, but I also don't care that much. That's what I meant, you don't have to particularly agree, it's just my opinion. I'm sorry if I didn't express myself clearly, english is still just my second language. I guess there can be more interpretation of this "morph" issue, but this one just seems the most logical and precise one. I'm a little confused when you say that "These geckos [high yellow carrot tail] are usually a mix of albinos with something, nothing specific". Obviously, any gecko with unknown genetics can have hidden recessive genes such as albino that we know nothing about and I agree that it is not a good idea to breed them, but I see no reason why a high yellow carrot tail would necessarily have an albino gene. Did you mean, perhaps, that if I label someone's gecko they will assume that they can now breed it because they know what it is, and that increases the danger of mixing albino strains? I'm not talking about hidden recessive genes here. Obviously the gecko can (and most probably has) some. I'm saying that there isn't any specific dominant gene visible and that is in my opinion the most important. The albino trait was just an example. Not only I'm saying that this gecko should not be bred, it should not exist in a first place. First of all, it messes up the work of many professional breeders. 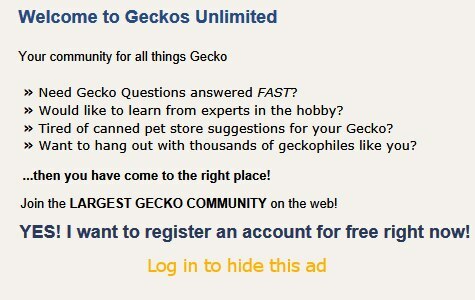 Second, it raises up prices of more "pure" geckos. I don't mean to sound like a fascist here. It's just that lots of us are trying to make something nice, breeding just our best geckos and then here comes Johnny and mixes up Bell het eclipse and Tremper het blizzard and ends up with bunch of "high yellow carrot tails".Timmy buys the mongrel, comes to this forum and you tell him it's a "high yellow carrot tail". "Oh, that sounds awesome", says Timmy. Goes and buys another one and starts breeding more mongrels. All I'm saying is, that we probably shouldn't give pointless mix of something a fancy name, because soon it would be hard to find a gecko with (like you said) clearly dominant, co-dominant or recessive trait.